I did a poll on Twitter last week asking if you'd like to see a post on how I go one to two weeks without washing my hair and the majority of you said you'd like to see it. Of course, everyone's hair type is different; some have more oily roots whereas others can naturally go days without shampoo. I've always had dry lengths due to it's curly nature and as I've dyed it for over ten years now, it's quite damaged throughout too. I go cycling outside several times a week for a couple of hours, so I do work out using these tips too. Start Small | If you're somebody who washes their hair daily or every other day, then you won't feel comfortable going straight to two weeks without washing it. When I first started, I was lucky as I could go at least four days without needing to reach for the shampoo and over time I've managed to train myself to leave it longer each time. If you wash your hair every day, try and make it every other day for a month and then take it up to once every 3 days. Building it up that way will make it seem less daunting and help you get used to it. Getting A Blow Dry/Hair Dye Will Help | Not the kindest thing to do to your hair, but if you're a regular hair dyer like myself then you'll probably already know that when you dye your hair, you can leave it longer without washes. Likewise, if you give yourself or go to a hair dressers for a professional blow dry, I find that this enables me to go without washing for longer too. Don't start dying or blow drying your hair if you don't already as this can be counterproductive, but it's one to remember if you're off on holiday or you need to prolong it for a work trip. 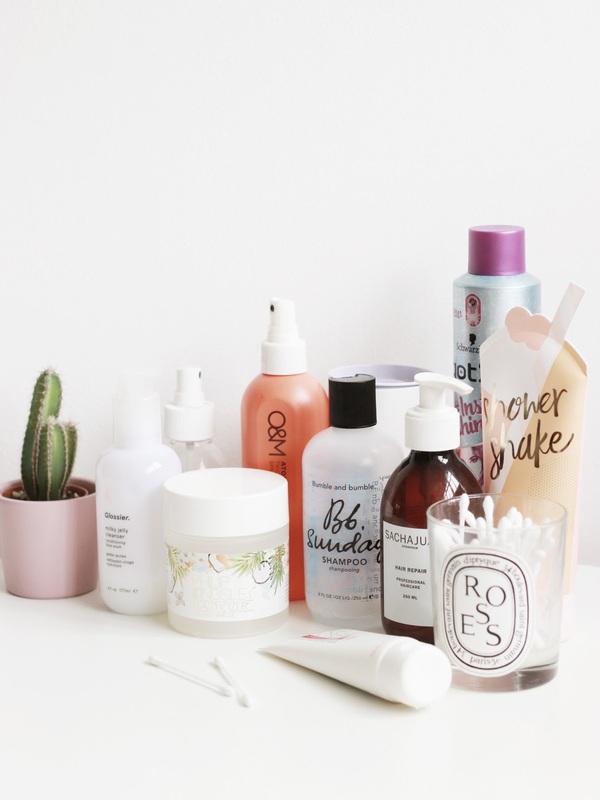 Excess Products | We've all been there, used a hair mask and as you hop out the shower to notice the you've still go half of it left in your hair and no matter how many times you wash it, you can't seem to get rid of it. Well, I now try and avoid excess hair products and although I'm not opposed to a hair oil or two (the ends of my hair gets dry due to being curly), I try and reduce my hair care routine down as much as I can. Tie Your Hair Up | The more you touch your hair, the more likely your scalp will produce oil. To avoid this, I only leave my hair down when I absolutely need to, but as soon as I'm indoors, exercising or just fancy sporting an up-do, I always tie it up as it prolongs the time between washes. Tom made a good point about wanting to wash your hair more if you work in an office, but I promise that sticking your hair up in a fancy bun can help you to not wash your hair more. Keeping your hair out of your face helps your skin too as I do find that the oil my hair produces can affect how my skin looks. Obviously I have a rigorous skincare routine in place, but making sure that I take extra care once my hair begins to get oily is very important too, otherwise you can experience some spots around your forehead. It Gets Better | Don't hold me to this as I'm not a scientist, but over time the amount of oil my scalp produces has lessened as time has gone on. I can now get a good week out of washing before my hair starts to look shinier at the roots, but I try and power through for a couple more days when this happens by tying my hair up as over time, it gets better the longer you leave it. How long do you leave your hair in between washes?